Hey, fellow Explorers! Welcome to the continuing report of our trip to Hong Kong. 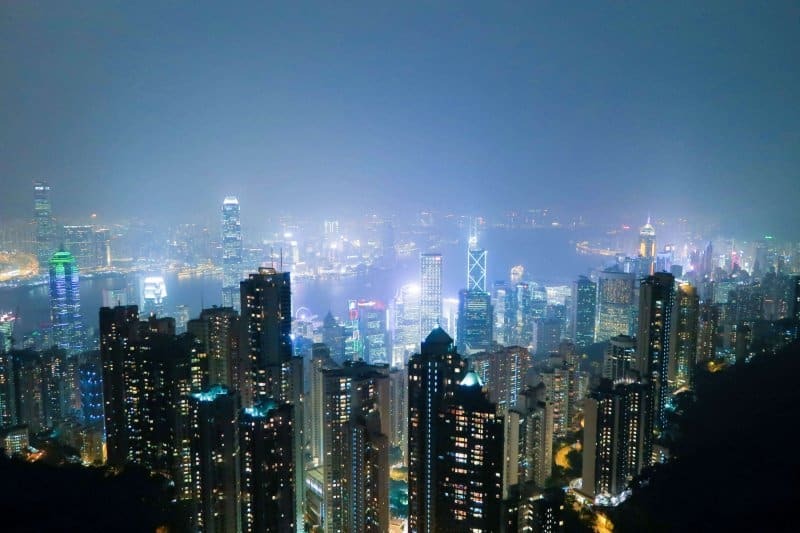 After our magical and Michelin-starred filled night in Macau, we made our way to Hong Kong. We still had a full day before Hong Kong Disneyland, so we spent a half-day at Ocean Park, topped off with a gorgeous view of Hong Kong from Victoria Peak. While this part isn’t Disney related, I wanted to share each portion of the trip. This way you can get ideas for your own trip because there is a high chance you’ll want to do other things outside of Disney! Full disclosure: our tickets for both Ocean Park and Victoria Peak were provided by Klook. 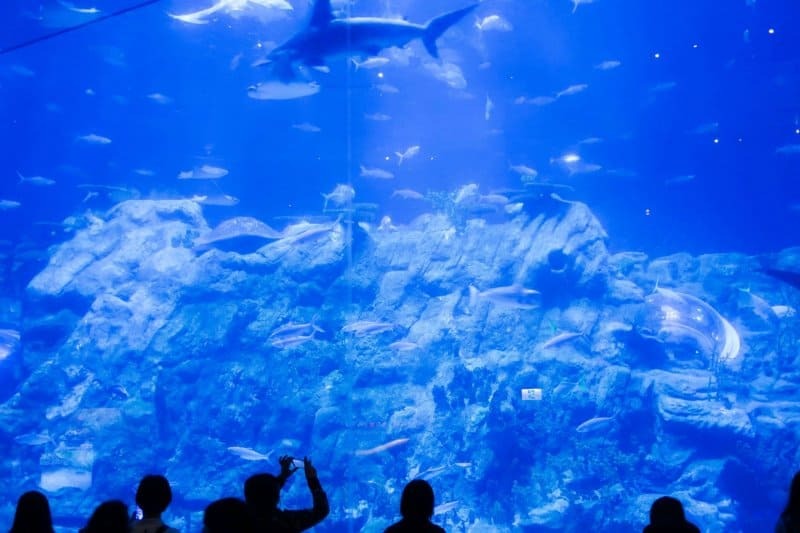 We chose to do these attractions and asked Klook to provide tickets. They did not provide our hotel or transportation. Those costs were covered by us. Read our full disclosure for details. 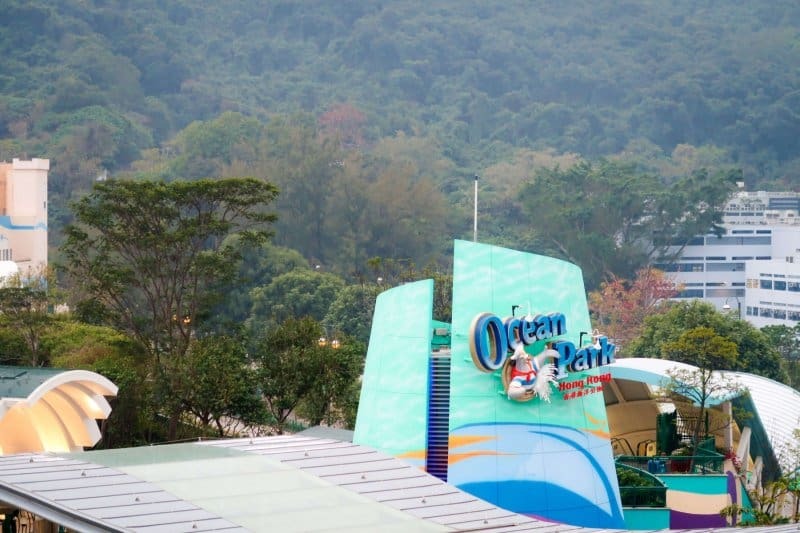 Now, let’s get on to Ocean Park! Leaving Macau was simple and stress-free. We took a taxi from the hotel (I didn’t take note of the price; I was too excited to get to Hong Kong) to the ferry and went right into Hong Kong. We used Cotai Water Jet again and traveled First Class. You can take the hotel shuttle, but we missed it by a few minutes and didn’t want to bother waiting for the next one. 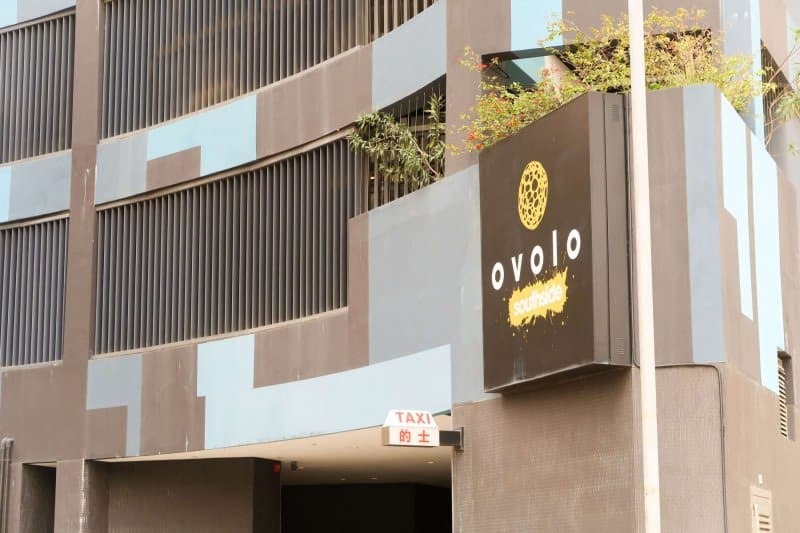 Once we arrived in Hong Kong, our next task was getting to the Ovolo Southside Hotel. We had to walk from Hong Kong Station to Central Station and take the Tsuen Wan Line to Admiralty Station. There we transferred to the South Island Line to Wong Chuk Hang Station. It sounds complicated, but it’s not too bad. Refer to the Google Maps directions below and you’re in good shape. It took us about 30 minutes to get to the hotel from Hong Kong Station. 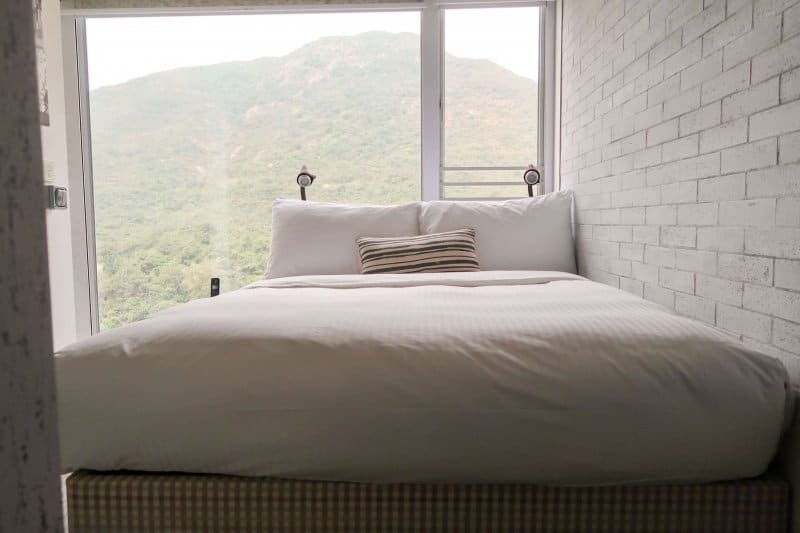 The Ovolo Southside is a small but modern hotel that had the most friendly and helpful staff (English is well spoken in most places in Hong Kong). The interior decor of the lobby had a trendy urban feel to it (and the lobby featured a pool table). We paid about $100 USD a night for the hotel, and we split into 2 rooms since each room only fit 2 people. The room was small (not a lot of room if you have tons of luggage), but the view we had made up for it. While it’s not the best view of the city, just having a wall that is only a window by the bed is awesome in my book. The shower room was a wide open corner room that allowed natural light to pour in. Also, we need to talk about all the amenities it came with. It had an Apple TV to use, a fully stocked bar with soft drinks, snacks, alcohol, and a free tote bag. The beds are firm, but that is par for the course in most places in Asia, and I much prefer firm anyway. The easiest way to describe the room is that it has an industrial aesthetic, which works. 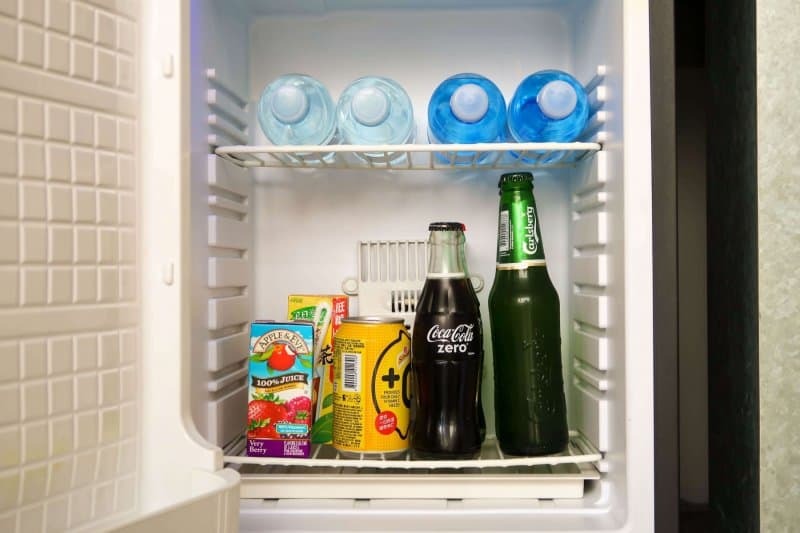 If there is enough interest, I’ll write up a full review of this hotel (let me know in the comments). The main reason for staying at Ovolo Southside was for easy access to Ocean Park, which is a 15-minute walk or one train station away. The park is separated into two portions — The Summit and The Waterfront — by a large mountain. 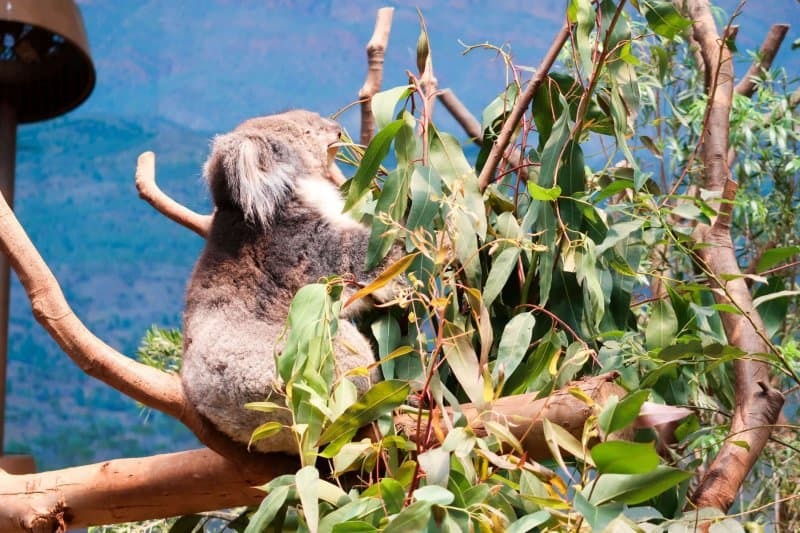 The Waterfront (lowland) has a lot of the wildlife exhibits with pandas, marine life, gators, and even koalas. There’s also the Waterfront Plaza that has various entertainment throughout the day. While The Summit (highland) has all the thrill rides and other family-friendly attractions. I won’t go into detail about everything they have, which is covered on the official website and Wikipedia. 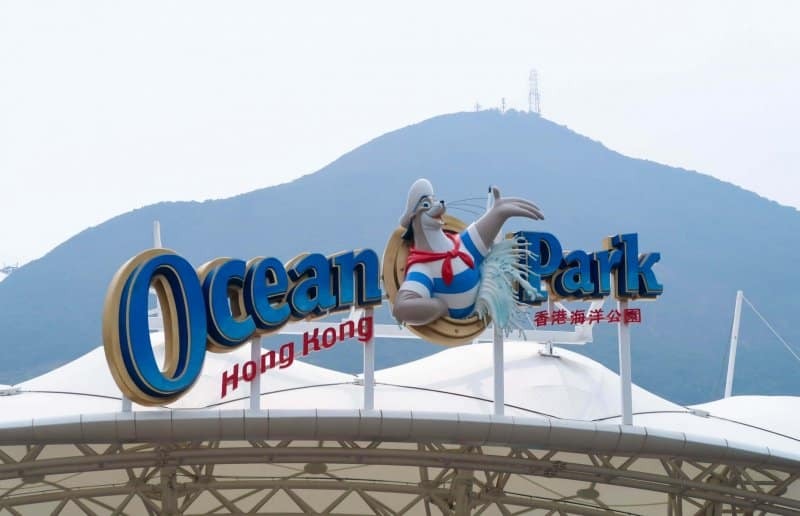 You can buy your Ocean Park discount park tickets from Klook for $HK380 (~$49 USD). Use our promo code KLKTDREX for more savings on your first order. You save about $7 USD compared to buying them at the gate for $HK438 (~$56 USD). Since we arrived at the park later in the day, we figured it was best to head to the top first to ride some of the attractions. To get to The Summit, your choices are the cable car or the Ocean Express Funicular Railway. 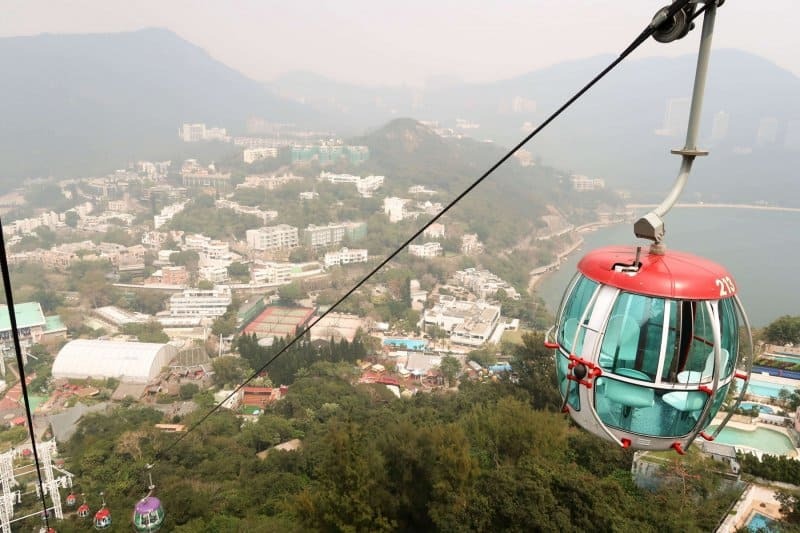 We opted for the cable car going up the mountain, which gives you a beautiful view of the bay and the rest of Ocean Park. I recommend doing this at least once just for the view alone. 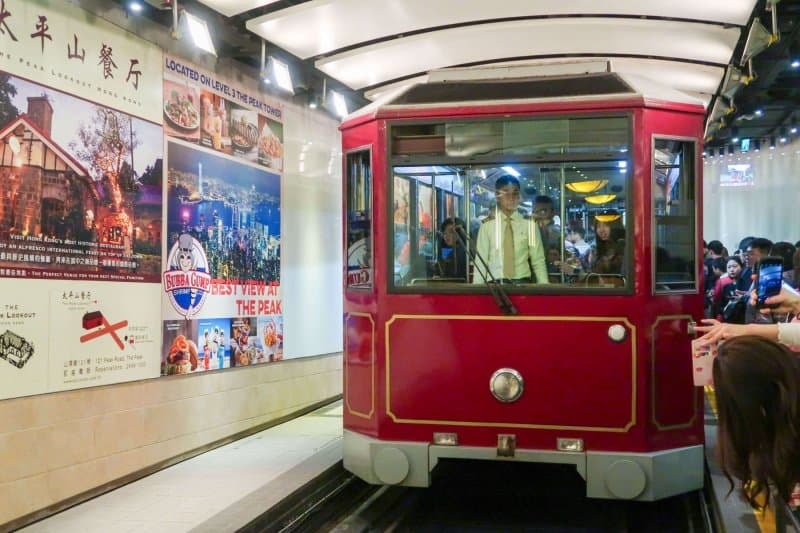 To get to the cable car loading area from the bottom, you walk through Old Hong Kong, which captures the essence of this wonderful city during the 1950s to the 1970s. 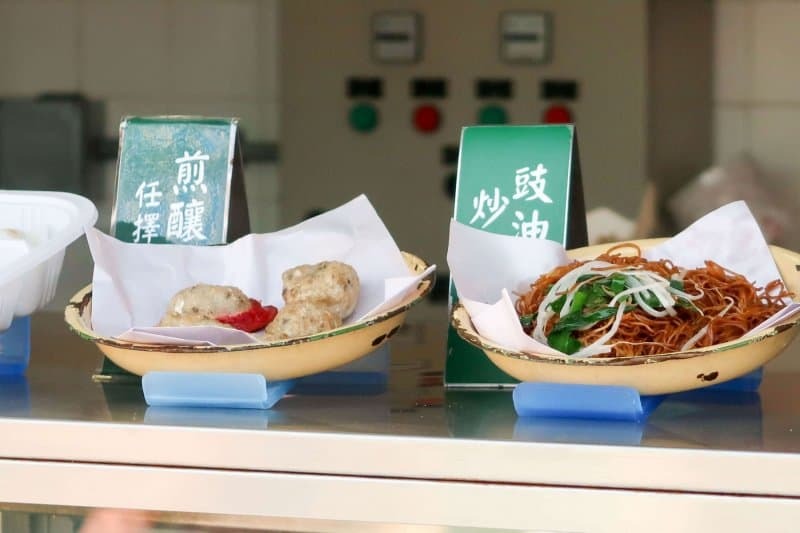 It features tong lau-style apartments to street vendors serving over 70 types of local street food. While the area is small, it’s worth it to take the time to soak in the detail. 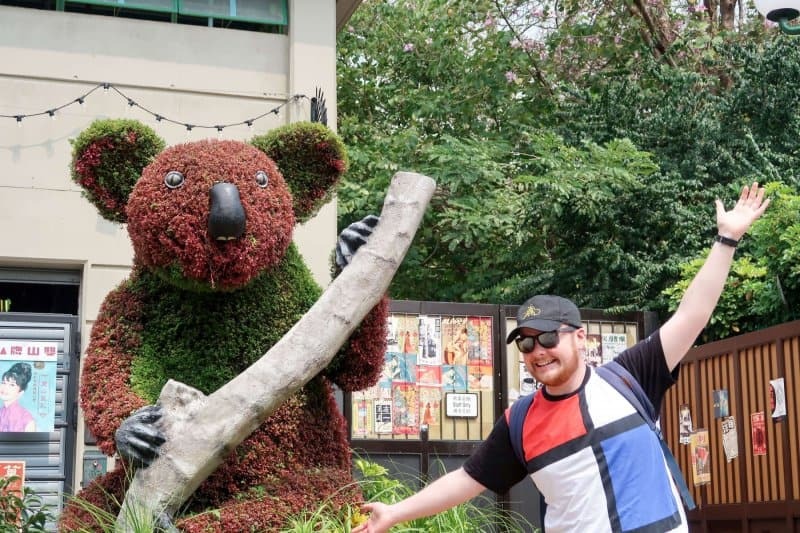 I thought Old Hong Kong was the best part of the entire park. 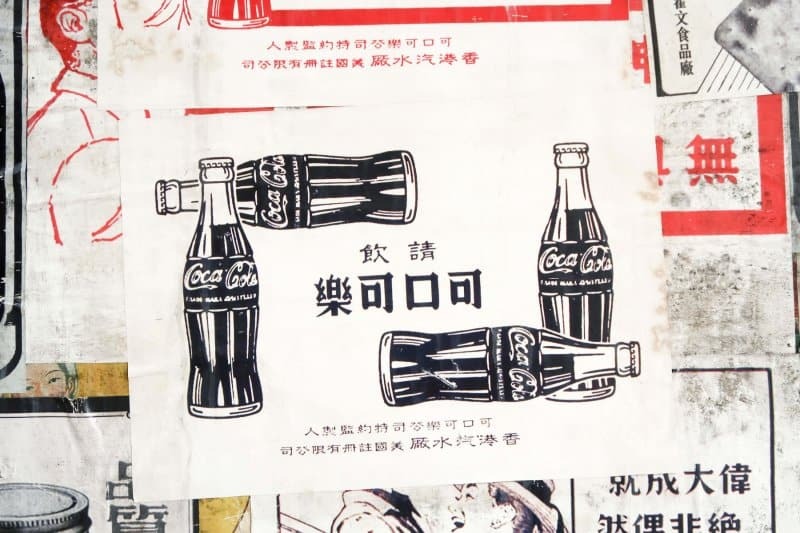 The detail is spectacular — I am guessing since I never actually saw Old Hong Kong, of course. And while it’s small, you can appreciate the effort that went into it. The odd thing there is the koala exhibit, which felt out of place, but I can’t argue with adorable koalas. Once we got to the top, it was a bit confusing to figure out the layout of the park. It goes every which way and takes a bit of time to get yourself situated. Make sure to grab that park map, which is invaluable. While trying to get ourselves situated, an excited woman runs up to me with the biggest smile I have ever seen. She repeats the word “Hello!” about three times while pointing to her phone indicating she wanted a photo with me. I wanted to reply with “It’s me,” but I figured the joke wouldn’t have gone the way I wanted. This middle-aged woman was so thrilled and polite about it (even with speaking no English), I was more than happy to take a photo with her. Once we took about 10 photos — she kept pressing the shutter over and over — she looks me right in the eye and says “Hello!” shakes my hand and runs over to her group of girlfriends and begins showing off the prized photo she just took. I couldn’t help but smile. It’s those little moments that you always remember. I hope she enjoys the photos, and I wonder what she told her friends? I am always curious as to what others say when they take my photo. After the excitement of the photo, everyone wanted lunch. We decided on The Bayview Restaurant, which is located right beside the cable car. 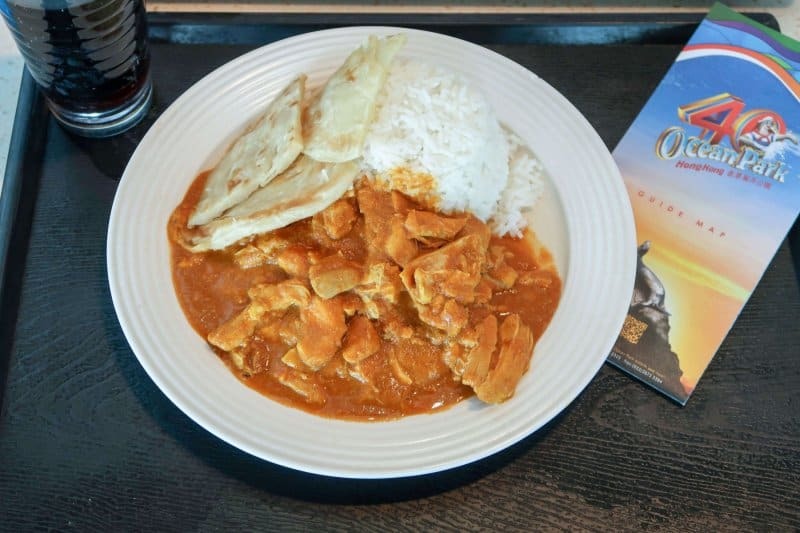 The restaurant had a variety of food to choose from and I went with the chicken curry. The portion size was huge but the flavour wasn’t. The chicken was tasteless and the spice from the curry was non-existent. Our park ticket included a single meal, which made it a bit more bearable, but overall I was disappointed. The meal included a drink, which we didn’t get to choose. They gave us a warm glass of Coke that was sitting on a tray beside the register (which I thought was a bit odd). This was our only meal experience at the park, so it’s hard to say how the rest of the park was for food. I should have tried the street food in Old Hong Kong, as it smelled delicious. There is a McDonald’s restaurant, however, so that may have been a better call. 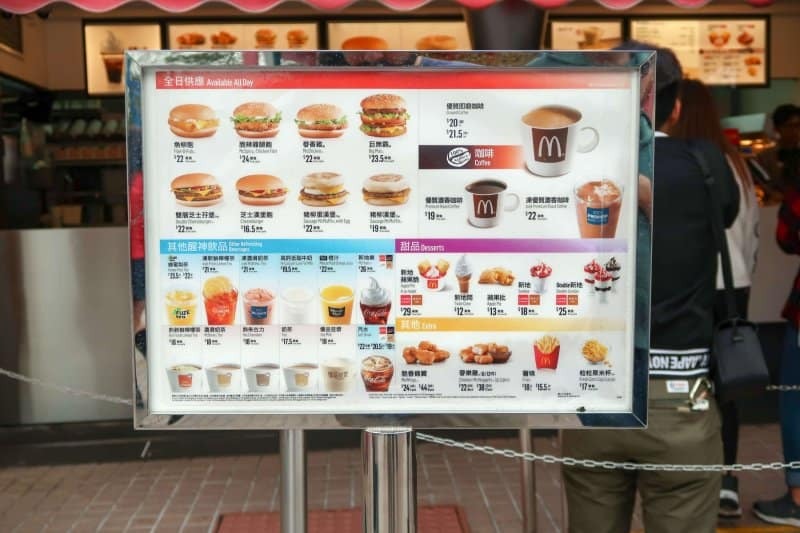 The prices at McDonald’s though are around 2-3 times more than what you’d pay outside the park (which isn’t surprising). If you decide to eat here, I won’t judge; your secret is safe with me. 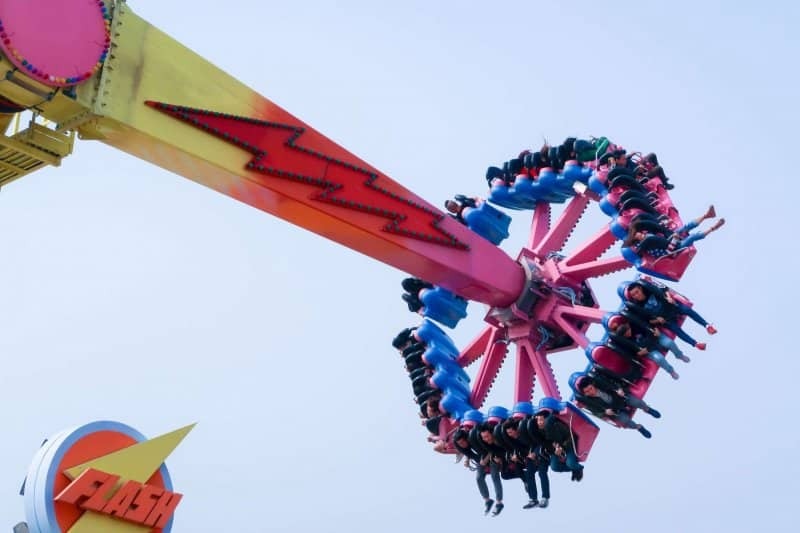 The best way to describe most of the attractions here is “carnival,” meaning, ones you would ride during the summer at your local exhibition or fair in Canada or the US. With that, we skipped most of the rides except for the rollercoasters. While I am not a connoisseur when it comes to coasters, the Hair Raiser was the best one, while The Dragon gave me flashbacks to the older version of Space Mountain 2 in Disneyland Paris — meaning it was rough and gave me a headache. We did want to try the Mine Train, as I have been told it has the best view from all the rides, but it was closed. We used their mobile app (which also contains coupons) to book a “FastPass” for select attractions. It’s called eScheduler, and we used it for The Rapids attractions. It made for a 5-minute wait instead of the posted 30 minutes. Which I am thankful for because the ride is short and is just an excuse to get soaked. They also offer a paid “FastPass” called FastTrack. 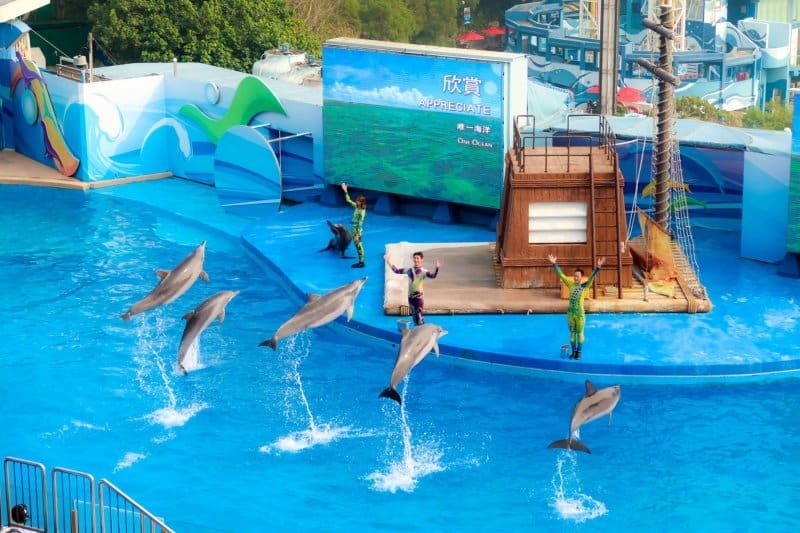 We watched this dolphin show in the Ocean Theatre, which was cute. That’s about all I can say about that. The show plays at various times throughout the day, so make sure to check the schedule. 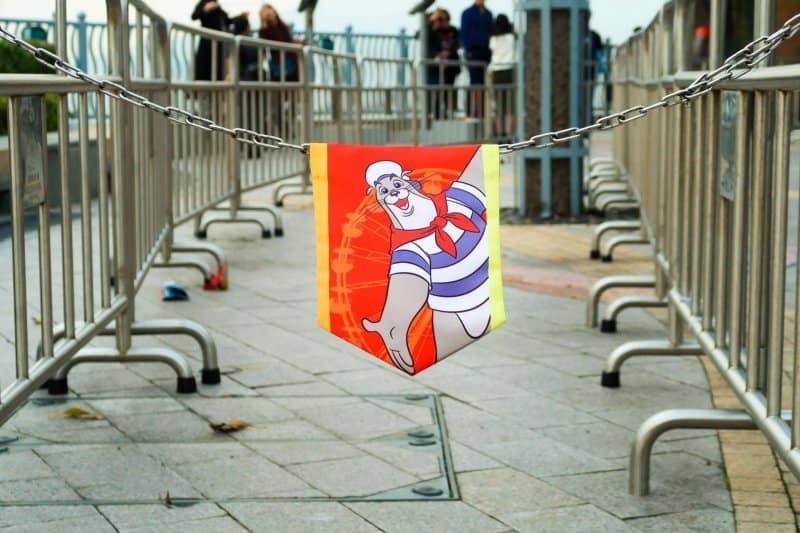 The best thing about the top of Ocean Park was the stunning view of the bay. There are many vantage points that make for postcard-worthy photos (I am not a photographer, so I can’t prove my theory). The animal exhibits and aquariums are quite lovely. While you can see a lot of this in other places (and you may already have), I still think it’s worth taking the time to explore. If you have kids, then it’s a must. Sharks, koalas, pandas, and other marine life, there’s something that everyone will find enjoyable. My absolute favourite part was panda exhibit. 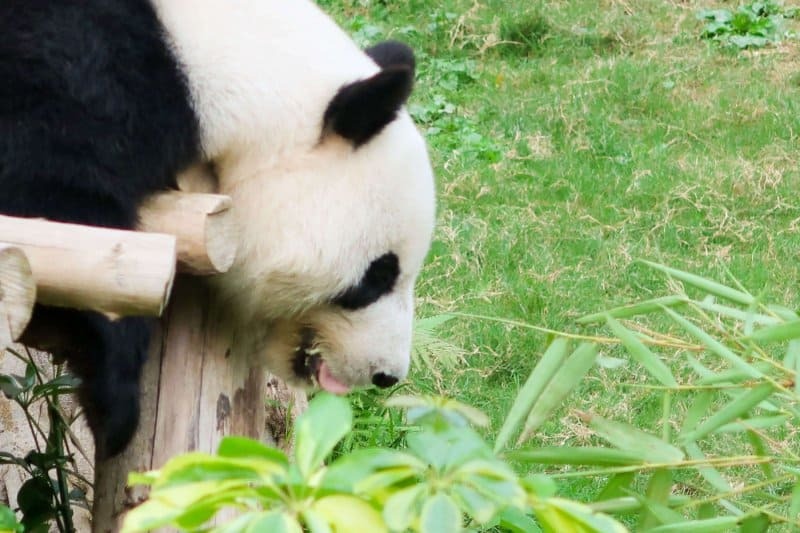 It’s cute, adorable pandas, what more can you ask for? 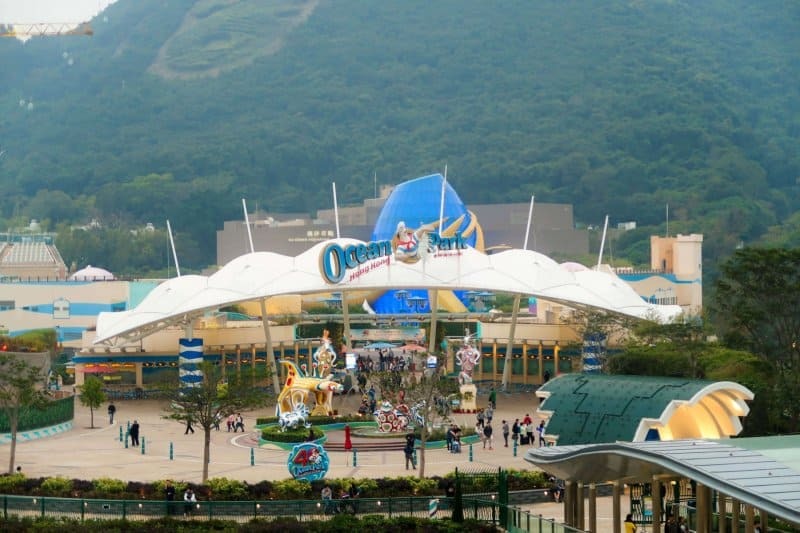 Overall, Ocean Park is a quaint park to visit for half a day (I couldn’t imagine spending any more time than that). While it’s not on the same level as Disneyland (and I wasn’t expecting it to be), it has its charms (Old Hong Kong is fantastic) which make it worth visiting. 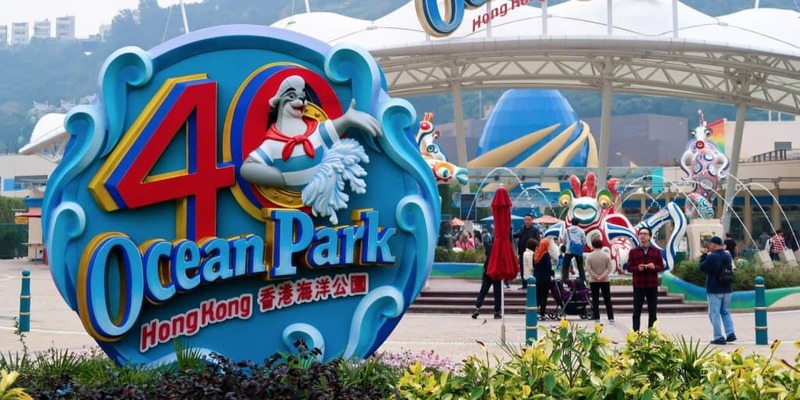 I can write up a guide for this park and how to work it into your Hong Kong Disneyland trip. If you’re interested, let me know in the comments. Once Ocean Park closed, we made our way to Victoria Peak. 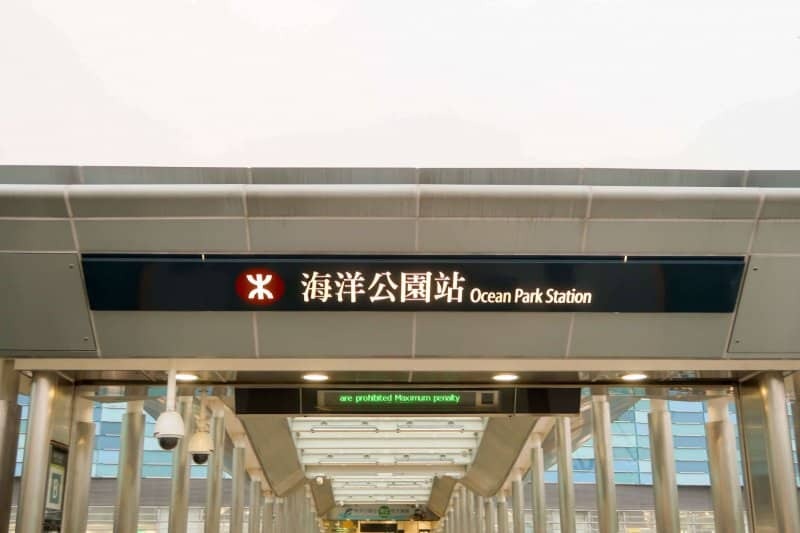 Take the South Island Line from Ocean Park Station to Admiralty Station and walk to the Peak Tram Lower Terminus. There are signs pointing you in the direction to walk, so there are no worries about not finding it even without Google Maps. A round-trip adult ticket that includes The Peak Tram and Sky Terrace 428 costs HK$90 at the gate. Or you can buy your Victoria Peak discount ticket ahead of time through Klook for HK$80 (~$10 USD). Use our promo code KLKTDREX for a discount off your first purchase. You take a tram up a steep incline to the base of Victoria Peak. The tram goes from the middle of the city — so much so the tracks go over the streets below — to 396 metres above sea level, where you find The Peak Tower. 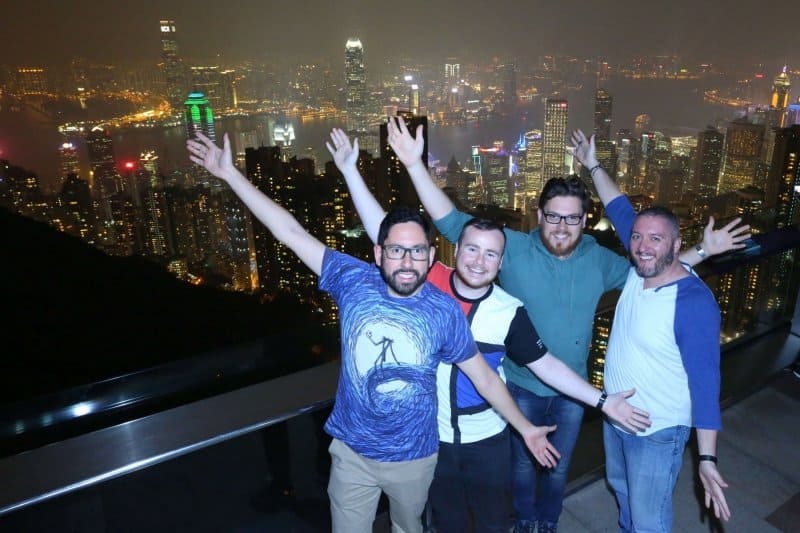 Inside it are souvenir shops, Madame Tussauds, and even a Bubba Gump Shrimp Co.
At the top of The Peak Tower is Sky Terrace 428 which has a 360-degree view of Hong Kong, and is the most gorgeous view of a city you’ll see — and I don’t say that lightly. 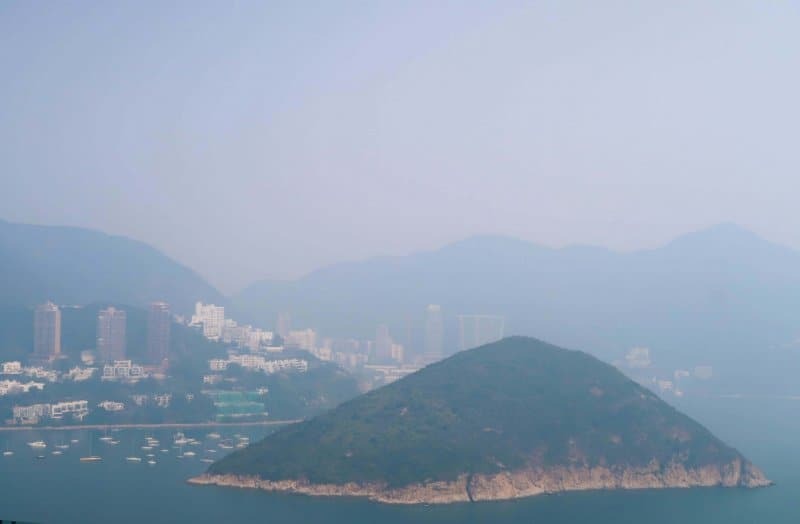 This is the best view of Hong Kong, hands down. Being at the top, you see just how small we are when we are down on the streets below. The skyline is illuminated by the large office and apartment buildings. 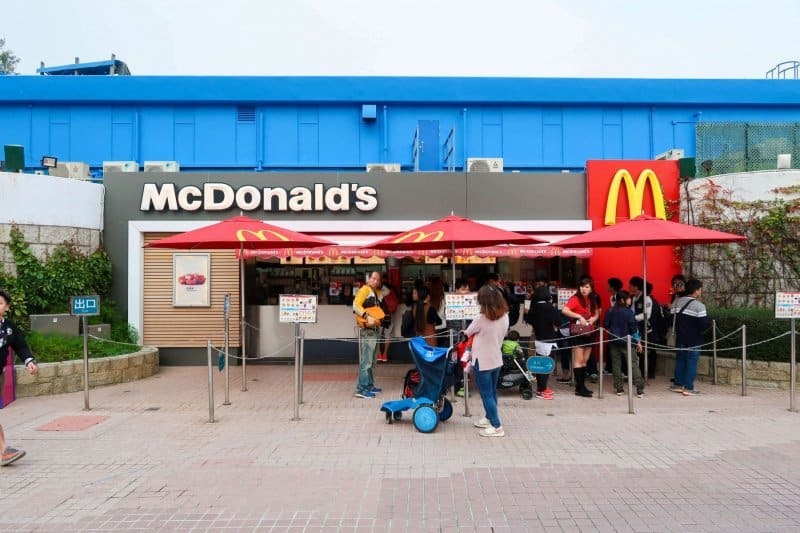 There’s a reason why this is such a popular spot in Hong Kong. The only downside is how crowded this area becomes, so it’s a bit frustrating trying to take a nice photo since everyone wants to capture that moment. The group of us opted for a photo taken by one of the photographers there. While the photo is overpriced, I can’t complain about how it turned out — you get multiple photos and the option to have them all emailed to you. Again, I forgot to take note of the price (I am terrible at that). If you want to avoid the crowds on the right side, head on over to the left where there’s little to no people. The view isn’t as “picture perfect” on the right, but not having hundreds of people crowding in a corner makes up for it. There aren’t many moments in life where my breath is taken away, but this was one of them. A gorgeous night skyline of a fantastic city and sharing it with special people makes it all worth it. It made me stop for a moment and just admire the view and appreciate the beauty that life presents us every once in a while (no, I wasn’t looking at myself in my front camera on my phone). If there’s one piece of advice I can give for Victoria Peak, it’s to take 5-10 minutes to just appreciate and enjoy the view. Plug your phone into your external battery and put it in your bag, hold your loved one(s) or friends and appreciate one of the most beautiful city views you’ll see. Of course, do this on the left side to avoid the sea of the selfie sticks on the other side. We did this during the evening, so I can’t compare the view during the day. But if I had to take a guess, the nighttime view is much more popular, and with good reason. Don’t judge, but we did head to Bubba Gump Shrimp Co. afterward since everyone was starving. Once we got back to our hotel at the end of the evening, we all took a breather on the rooftop bar and enjoyed the city lights and adult beverages. There’s something special just being in the company of fantastic human beings and just reminiscing about the events of the day. They have quite the drink list, so you should find something you’ll enjoy. We sat outside on the comfortable couches. There are seats inside, but who does that when you can sit and enjoy the nice breeze and view? 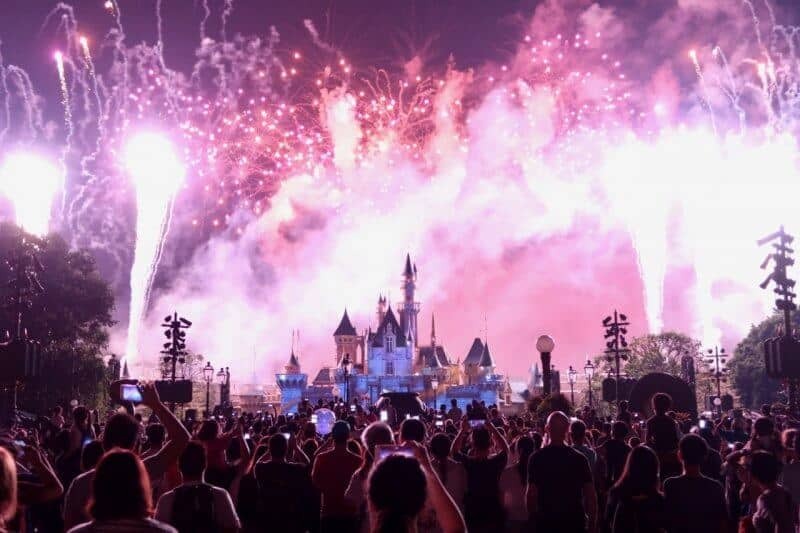 Now, it’s on to Hong Kong Disneyland, where we spend 2.25 days at the park! The 0.25 will make sense later, I promise. If you’re looking for other discount tickets for activities within Hong Kong, Klook is an excellent place to poke around. 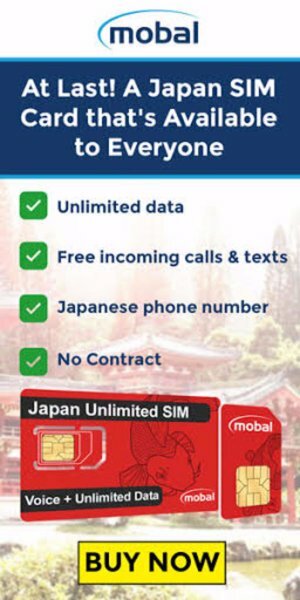 They also offer Wifi Hotspots and SIM cards for your trip to Hong Kong. Great blog Chris. The view from the peak looks amazing just like a real life tomorrowland!! Thank you for reading Bertie! The view is stunning, I can’t wait to get back here!